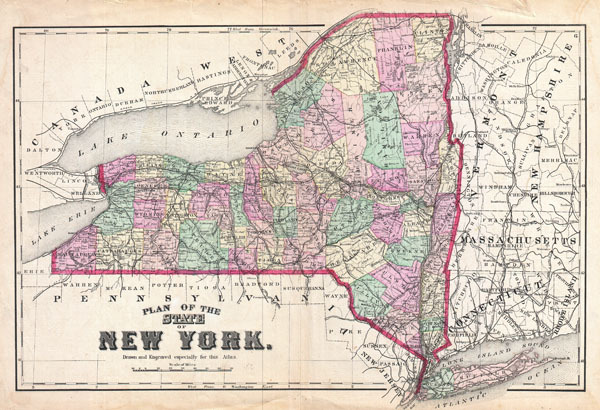 A scarce example of Fredrick W. Beers' map of the state of New York. State is depicted broken down into counties by color. Includes parts of Massachusetts, Connecticut, Vermont, New Hampshire and Pennsylvania, as well as Lake Ontario and Lake Erie. Prepared by Beers, Comstock & Cline out of their office at 36 Vesey Street, New York City, for inclusion in the first published atlas of Long Island, the 1873 issue of Atlas of Long Island, New York. Very good condition. Verso repairs to margin. Original centerfold. Text on verso. New York Public Library, Map Division, 1602737 (1868 variant).